Curated by Roberto Daolio & Alessandro Castiglioni. Geography of Proximity is a travelling exhibition part of the Little Constellation project. It tells the story of a journey through art—and the world inhabited by artists—of a constellation of small states in Europe, travelling to Andorra, Cyprus, Iceland, Luxembourg, Liechtenstein, Malta, Monaco, Montenegro, San Marino, and other significant geocultural micro-areas such as Canton Ticino, Ceuta, Gibraltar or Kaliningrad. The voyage of the two artist-researchers, Rita Canarezza and Pier Paolo Coro, intersects with an exhibition project curated by Roberto Daolio and Alessandro Castiglioni. With help from Mousse Publishing, they have been blended into a volume with an original graphic design that mingles pop images of sci-fi universes with the unique landscape and culture of the miniature universes explored in this study. This unusual investigation examines the potential for building a shared platform for artists, curators, and institutions in these areas, to carve out a place of their own within the international artistic debate. The book—half interstellar map, half catalogue —collects the works on exhibit and the biographies of the 20 artists and groups involved, using texts, images, and interviews to illustrate the legs of a journey spanning six years between 2004 to 2010. 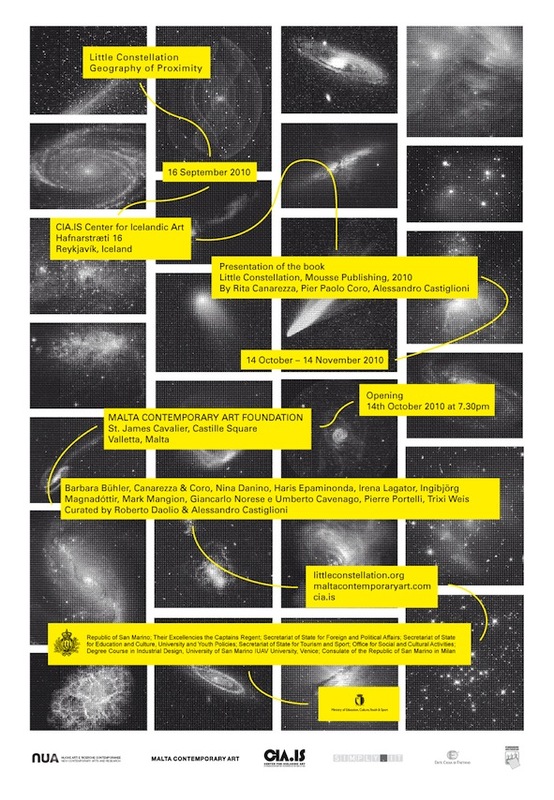 The Little Constellation catalogue published by Mousse will also be launched in Malta.